ILWU REMEMBERS WORKERS KILLED ON LOCAL DOCKS (LOS ANGELES HARBOR)—When International Longshore and Warehouse Union (ILWU) leaders and retirees come together on Thursday morning to honor dockworkers killed on the job in Los Angelesharbor since 1934, they will gather barely a month after laying to rest longshoreman Carlos Rivera, whose April 4th death makes him the twelfth longshore worker killed on the job on west coast docks since 2002. "Working on the docks is dangerous," ILWU Local 13 President Joe Cortez told the press in April, "but it doesn't have to be deadly." The ILWU's annual May 15th worker memorial is sponsored by the union's Southern California Pensioners Group (SCPG) to remember workers of Local 13 (longshore), Local 63 (marine clerks) and Local 94 (foremen) killed on the job. 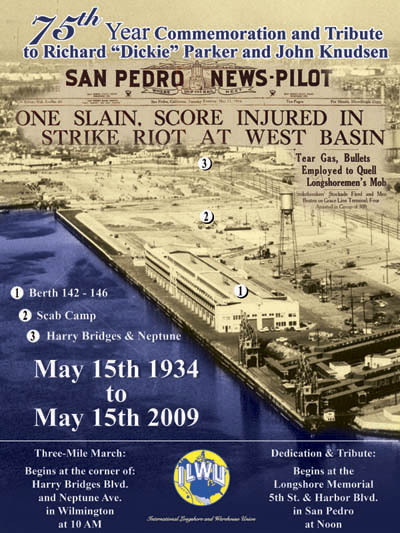 The May 15th annual worker memorial event marks the day in 1934 when striking longshoremen fought with police, guards and replacement workers in Wilmington. In Feb. 1934, westcoast dockworkers approved a coastwide strike, called for May 9th. The two workers shot by police in Wilmington on May 15 -- Dickie Parker and John Knudsen -- came just six days into the strike and became the first killed on on the waterfront in the tumultuous strike that led to the formation of the ILWU. Pensioner Art Almeida, a retired longshoreman and former ILWU Local President, organizes the annual event. The pensioners erected a permanent memorial in 2005 and now feature a port chaplain and bagpipe player at each year's ceremony. "It's a very special, hallowed place for us," said ILWU SCPG President Al Perisho. "Unfortunately, we're going to add another name, from April 4th when Carlos Rivera was killed and that's a tough proposition. We've lost a lot of people." Rivera, a longshoreman with 40 years on the waterfront, was crushed by a heavy-lift forklift as a crew was unloading steel at the California United terminal. "If someone get hurt now, they're usually losing their life," said Perisho. "The machines are big. These cranes are big. It's productivity, productivity, productivity." Safety is a key issue between the ILWU and employers. The two sides are currently negotiating the next version of the west coast longshore contract that is due to expire on July 1. The event, usually attended by several hundred, features city officials, retirees, loved ones, current workers, and leaders of the Pensioners group and the ILWU Locals for longshore workers, marine clerks and foremen.The ILWU Southern California Pensioners Group annual tribute to fallen workers takes place Thursday, May 15th at 10 am at the ILWU Worker Memorial and Benches, located in John S. Gibson waterfront park on Harbor Avenue, between 5th and 6th streets, in San Pedro.